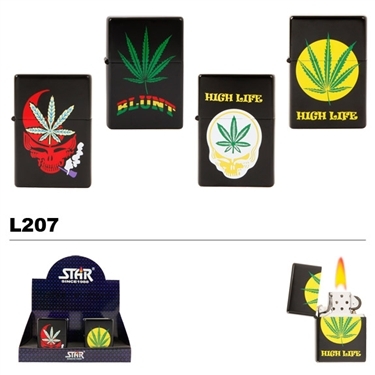 This is a very popular style of lighter, with pot leaf designs in for different graphics. Large Oil Lighters are high quality, refillable lighters that come in a STAR® display box. These large oil lighters measure approx. 3.5"(height) x 2.5"(width). Approximately 33% larger than the standard oil lighter. All of our wholesale oil lighters are refillable, wind proof and best of all have replaceable wicks and flints.These sell great in convenience stores, gas stations, truck stops, fairs, flea markets, malls and really just about anywhere.